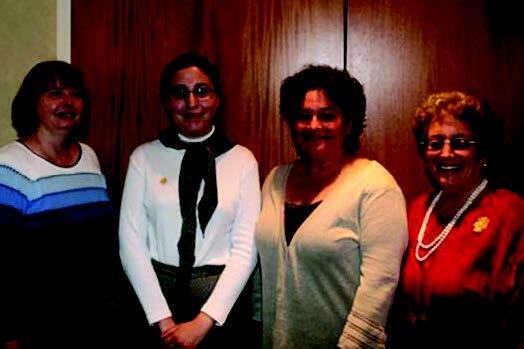 Friends’ Board Members and Epsilon Theta Representative (left to right)- Janice Provencher; Alyssa Kersting, MIT Epsilon Theta Fraternity; Ellen Forrestor, and Betsy Shure-Gross. New and old Friends gathered together at the Annual Meeting of the Friends of Hall’s Pond on June 16, 2008. The Friends awarded the MIT Epsilon Theta Fraternity an Outstanding Service Award. Alyssa Kersting, Community Service Chair, accepted the award on behalf of the fraternity. For more than 25 years Epsilon Theta members, while residents in their St. Paul Street fraternity home, have participated in the Friends’ annual spring and fall community work days at Hall’s Pond and Amory Woods. They have carried out their fraternity pledge to develop lasting friendships, to help others achieve their respective goals, and to be responsible to others and the community. Their commitment to these values has resulted in immeasurable contributions to the sanctuary. The meeting also featured a slide show presentation and panel discussion on sanctuary management. The audience’s thoughtful questions were addressed by panelists Randolph Meiklejohn and Gail Fenton. Both are board members of the Friends of Hall’s Pond and serve on the Brookline Conservation Commission. Summary reports on the various aspects of the Friends’ organization were given and board nominations and re-elections were held. The Board welcomes your suggestions for award recipients, topics for future annual meetings, and content ideas for future newsletters.